Destination weddings are becoming a popular option amongst couples nowadays, with them holding their weddings in countries which brought much significance to their lives – Qianchi and Heren are one of the many who decided to celebrate their big day away from their home country, in the small but beautiful Singapore. 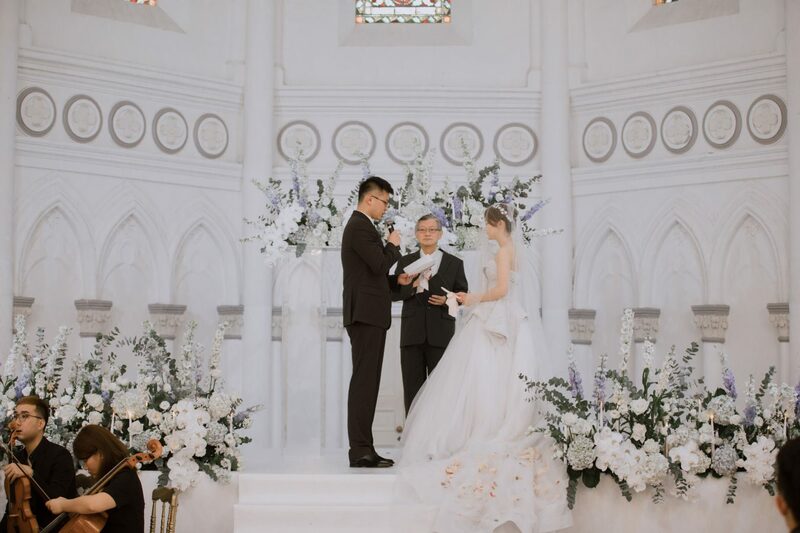 A few years back, the couple went through a long-distance relationship while Heren was pursuing her University Degree in Singapore, making this tiny red dot the special place where they decided to hold their wedding. As the couple was based in China, discussion of wedding details was mostly carried out through phone calls as well as through Wechat. Even with these hurdles, the decisive nature of the couple allowed for productive meetings and conclusions to be arrived at easily. To express their heartfelt thanks towards beloved guests for taking time off their hectic schedules to grace their wedding, the couple prepared several welcome gifts upon their arrival in Singapore – A box of Traditional Chinese wedding pastries and a welcome bag, each containing maps which indicated important locations of their wedding – The sincerity and thoughtfulness of the couple was definitely felt by guests, as they received the gift with smiles beaming from their faces. 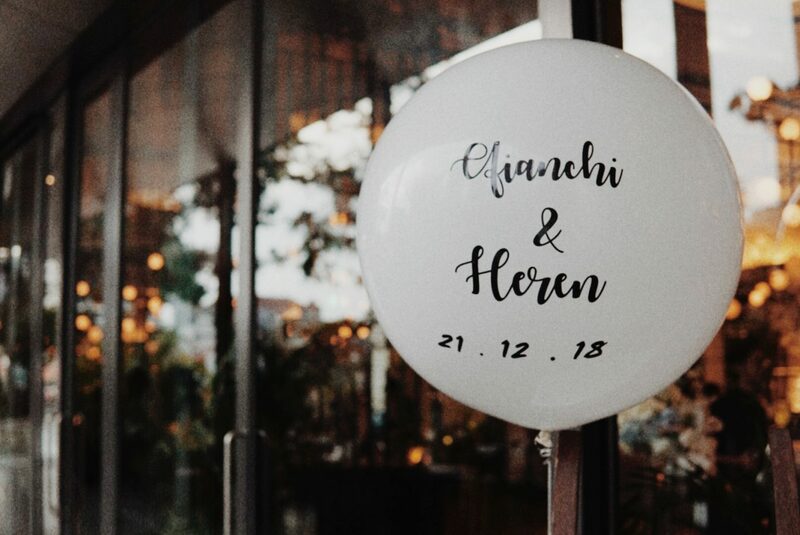 21st of December 2018 was the day Qianchi and Heren decided to tie the knot in the lands of Sunny Singapore. At the break of dawn, the day begun with Heren, her mum as well as her bridesmaids commencing their make-up. While guests were preparing to look their best for the day ahead, our team was over at CHIJMES, making sure it looked perfect for this very important day as well. 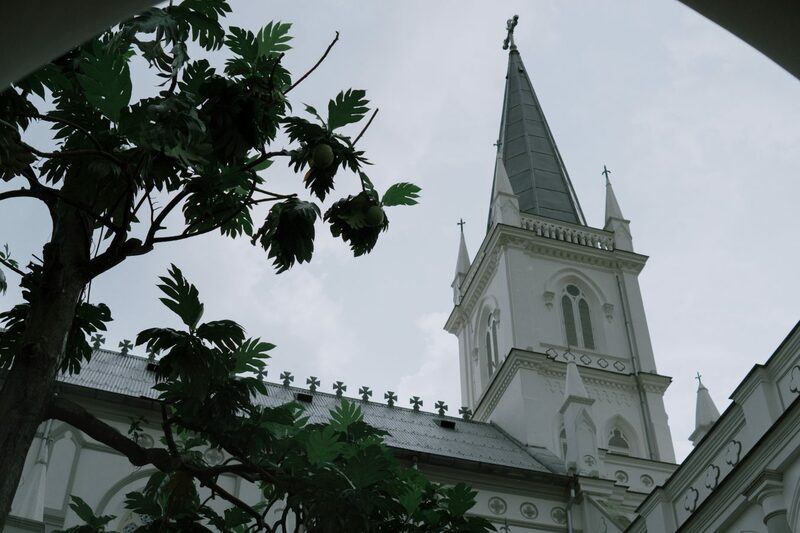 With its sacredness and purity as a whole, CHIJMES was the perfect wedding venue for the couple, as they admired and loved every corner of the vicinity. Gold tiffany chairs were arranged in rows at the front of the church for the solemnization ceremony, while two long tables were set up at the back for the lunch reception. 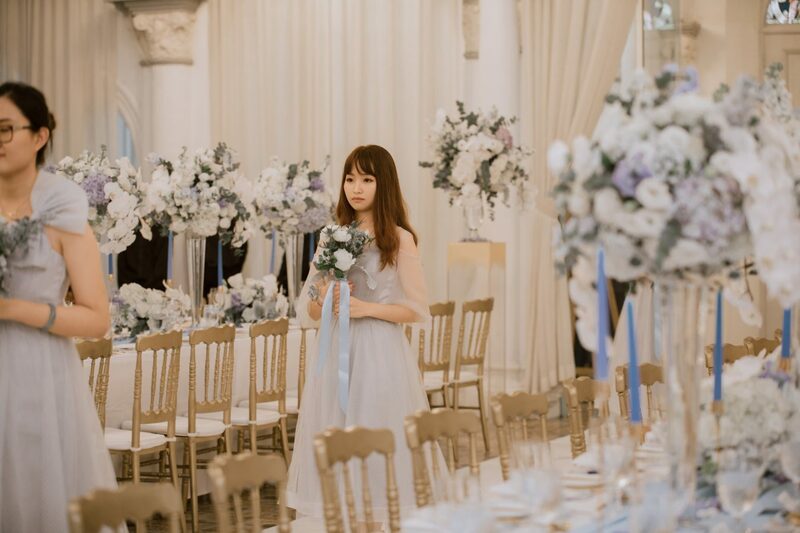 Separating these areas were two white album tables, each lined with baby blue runner cloths – Decked with photographic memories of Qianchi and Heren, it was the perfect depiction of the love they had for each other throughout these years. The main portion of their décor was presented on the dining tables, where florals of white and blue were complemented by cutleries of gold. On top of these, personalized name cards were placed on tables to indicate each allocated seat, complete with a well-thought door gift for guests to enjoy before the start of lunch. The overall look was exquisite and divine, with a white carpet laid along the aisle in anticipation of everyone’s arrival. Back at Fullerton hotel’s lobby was guests of the couple, as they waited eagerly to hop onto buses which brought them to CHIJMES. It was not long after that the lobby was filled to the brim with laughter and joviality, as guests began discussing how happy they felt for Qianchi and Heren’s union as a wedded couple. 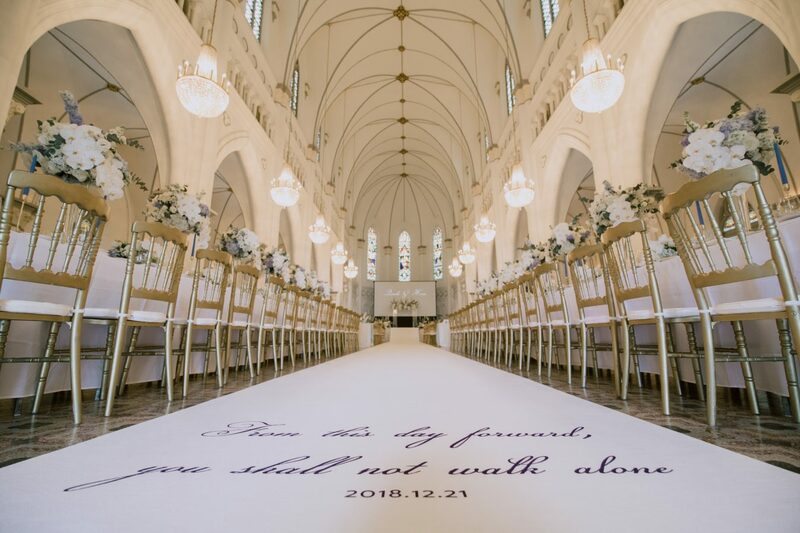 As guests arrived at CHIJMES, it was a rather bustling scene – some of them were eager to write their well wishes as well as sign their names in the guestbook, while others stood around photo-worthy spots of the church to capture precious memories of this moment. It was not long later till everyone begun taking their seats at the solemnization area. Once everyone got seated, kick-starting the programmes was a video by Qianchi’s mum, as she was unable to turn up at the wedding due to her busy schedule. In the video, she expressed her genuine blessings to the couple, wishing them a lifetime of happiness and bliss. The second video was a pre-wed video, put together by a professional videographer who flew in from China. It was made to look like a music video, which illustrated the affection and affinity between Qianchi and Heren impeccably. Step by step, the bride and her father arrived at the solemnization area. As Heren’s father gave her hand over to Qianchi, it signified the couple’s new beginnings, for two hearts to begin beating as one. After the solemnization ceremony was the lunch reception, where meals were specially selected by the couple to suit the tastes of guests. When guests were taking their seats at the long tables, the couple prepared for their official first march in, as a newly wedded couple. Doors opened as the music “Can’t help falling in love” by Michael Buble played in the background, where Qianchi and Heren begun their march in, whilst surrounded by guests who clapped in celebration. Prepared at the front was a magnificent 3-tiered wedding cake, designed according to the couple’s preferences. As the couple stood beside the cake, they held a knife hand in hand, carefully making the first cut, signifying their commitment to provide for one another as well as for good luck and fortune throughout their marriage. Following were speeches made by several important guests present – Heren and Qianchi’s friends as well as Heren’s father. It brought tears to many who were present, as they reminisced the memories they had with the couple, together with words of blessings for their future ahead. The couple too made their speech, where they thanked guests for traveling all the way to Singapore to grace their wedding. 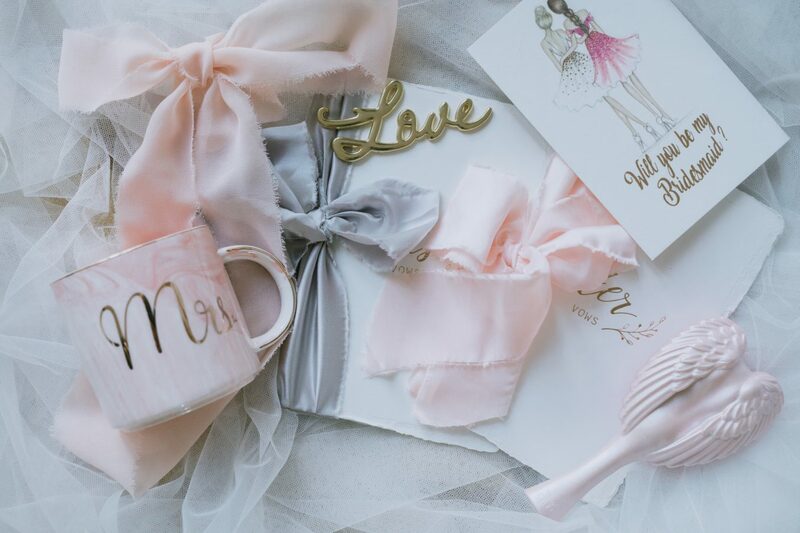 In most weddings, bouquets are usually tossed by the bride, where a guest who is lucky enough to catch it receives the luck of love from the couple. However, Heren decided to dedicate her bridal bouquet to her beloved friend Yuan Yuan, using this as a way to express her gratitude towards her friend for staying by her side since the past, no matter rain or shine. It was an afternoon filled with overflowing emotions which ended on a happy note, as everyone boarded the bus back to Fullerton Hotel to prepare for an exciting night to come. 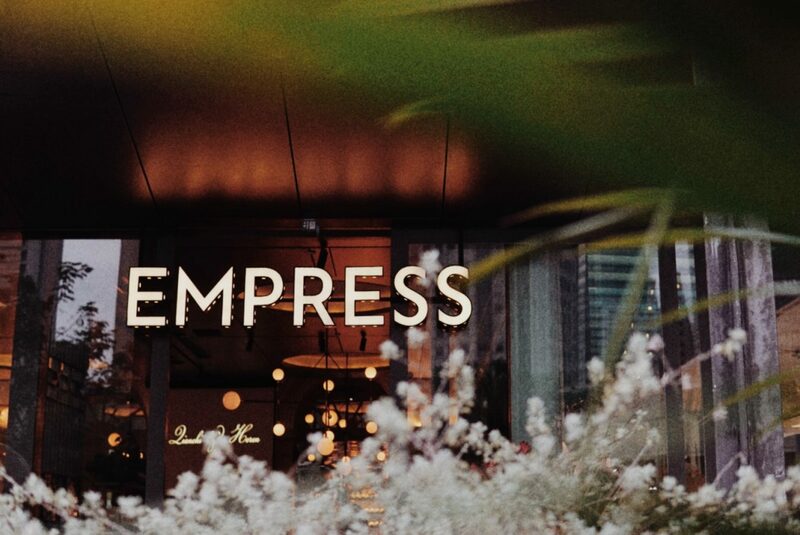 The couple decided to host an after party at Empress Restaurant, located within Asian Civilisation Museum. It was a restaurant which extruded traditional features within its dishes, contrasted by contemporary décor elements around every corner. With floral centrepieces of white and blue being placed on each table and a personalized photobooth at the side which was complemented by an entire balloon garland decorating the backdrop, the party was ready to begin. The emcee for the night was one of the couple’s groomsmen, who made a welcome speech to welcome guests as they took their seats. As some friends of the couple were unable to turn up for their wedding, they made a video collage with each of their clips to extend their blessings to the couple, officially kick-starting the night. Soon after, dinner commenced, and the live band begun playing music in the background to liven up the mood. In between dishes, a same day edit video was presented, allowing everyone to look back on activities which happened earlier during the day. 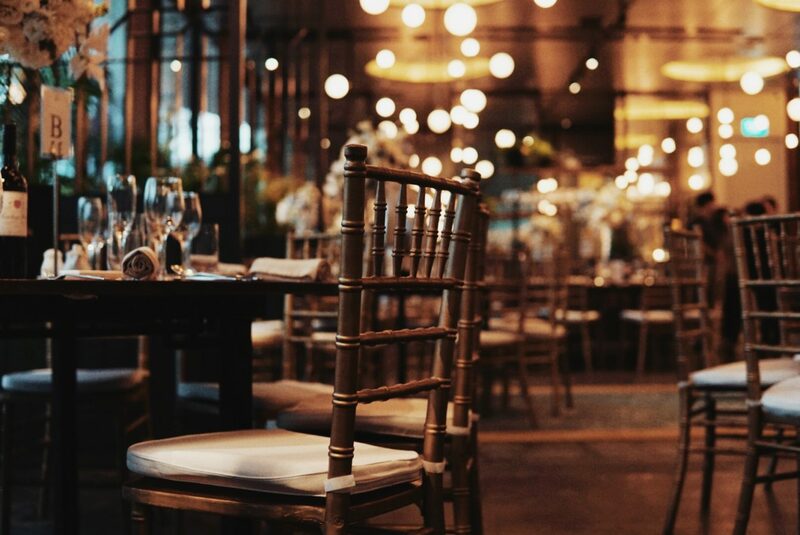 A wedding is never complete without performances – In Qianchi and Heren’s wedding after party, performances were put up by both guests as well as the couple. One performance which brought much laughter to the crowd was a dance by the couple and one of the groomsmen, where they grooved and sang along to the song “Closer” by Chainsmokers. What made this performance interesting was that the groom actually rapped along with the song lyrics – this caught us by surprise too! The night ended on a high note, with guests singing their requested songs along with the live band – not only adults, kids went ahead to sing in front of everyone as well! – This energized and hyped up the crowd over at Empress, making it a night to remember. As we come to the end of Qianchi and Heren’s destination wedding in Singapore, it marks the beginning of their journey as a wedded couple. We believe that both the couple and guests have made beautiful memories here in Singapore, and we wish for Qianchi and Heren to have a blissful marriage in many years to come! Planning your wedding and keen to find out about our services? Fill out the form below and we’ll be in touch!